Pericles Lewis, Douglas Tracy Smith Professor of Comparative Literature and Professor of English, serves as Vice President for Global Strategy and Deputy Provost for International Affairs at Yale University. Reporting to the President and the Provost, he is responsible for ensuring that the broader global initiatives of the university serve Yale’s academic goals and priorities. Lewis works closely with academic colleagues across all of the university’s schools and provides support and strategic guidance to the many international programs and activities undertaken by the university’s faculty, students, and staff. His primary responsibility is to enhance Yale’s international presence as a leader in liberal arts education and a world-class research institution. From 2012 to 2017, Professor Lewis served as founding president of Yale-NUS College, a collaboration between Yale and the National University of Singapore. Under his leadership, the college developed into a thriving model of residential liberal arts education much admired and studied throughout Asia and the world. He oversaw the articulation of the college’s mission, the development of its curriculum, and the recruitment of students, faculty, and staff. Yale-NUS College has been widely recognized as one of the most innovative undergraduate educational institutions in the world and has been praised as a model for reinventing residential liberal arts and science education in the context of 21st-century Asia. Lewis has become a respected authority on global arts and sciences education, and has spoken on educational matters and literary scholarship in many countries on four continents. In his new role, Lewis maintains responsibility for Yale’s involvement in the ongoing work of Yale-NUS College. Since returning to New Haven, Lewis has led the planning for the Schwarzman Center, set to open in 2020, and provided oversight for the MacMillan Center for International and Area Studies, the Jackson Institute for Global Affairs, and related academic units. 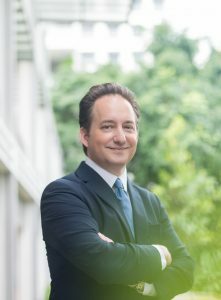 He works closely with the leadership of Yale-NUS College, the Paul Mellon Centre for Studies in British Art in London, the Yale Center Beijing, and the Yale Institute for Global Health. Pericles Lewis earned his B.A. with first-class honors in English literature from McGill University in 1990 and his Ph.D. in Comparative Literature from Stanford University in 1997. After a postdoctoral fellowship at the University of California, Berkeley, he joined the Yale faculty in 1998, with appointments in the Departments of English and Comparative Literature. Professor Lewis has been extensively engaged in the academic life of the campus, serving on an array of university committees and in departmental administrative roles. Lewis’s research shows how developments in literary form emerge out of a background of social, political and existential ferment. His work focuses on the modernists who revolutionized European literature in the early twentieth century; he explores their engagements with the broader culture and the distinctively literary solutions that they found for the central problems of their time. The author or editor of six books, he was also the founding editor of Yale’s Modernism Lab, an early digital humanities project. A former member of the advisory board of the American Comparative Literature Association, Lewis also serves on several editorial boards and as an advisor to various academic publishers, foundations, and educational institutions in the United States, Canada, Taiwan, and Japan. He has written for a number of academic journals as well as the Chronicle of Higher Education, The Harvard International Review, and Times Higher Education. Professor Lewis is widely recognized for his talents and dedication as a teacher, including courses for the Yale in London program and the Yale-New Haven Teachers Institute, as well as at Yale and Yale-NUS. He has taught undergraduate surveys of English poetry, the European epic tradition, and literary theory, and courses on modernism in literature and the arts ranging from freshman to graduate seminars. He has received a variety of honors and awards for his contributions to research, teaching, and service. Professor Lewis is a citizen of both Canada and the United States. His wife, Sheila Hayre, a graduate of Yale Law School, and former staff attorney at New Haven Legal Assistance, now teaches at Quinnipiac University Law School in North Haven, Connecticut. They live in New Haven with their two children.